In 2000, the Gulf of Georgia Cannery National Historic Site had a juried show "Workforces" with the focus to be on cannery workers,fishermen and their contributions. I wanted to come at the theme from a different angle and thought about present-day contributions of the descendants of the workers. Then I thought of Mrs. Sakata's garden - a Steveston treasure. Everyone passing by gets so much pleasure from viewing this garden. Kay Sakata is both daughter and wife of fishermen and has an extended family that has made many contributions to Richmond. Her daughter is a local school principal. Then I decided to do the painting as a triptych so that the size would make it a little like walking into the garden. I worked from my own photographs, edited out the stores across the street and proceeded to rough in the painting. I don't have an easel set-up that would work for a six-foot width of paintings so I worked on each section alternately, taking time to line them up against a wall to make sure the lines and colours matched. At the show opening, Kay Sakata was pleased to see her garden on display.The triptych was then shown for the summer at Gulf of Georgia. It was then selected to be in the Minoru window of Richmond Art Gallery for a show that fall. Then it came back home. Shortly after, an opportunity arose to display it in the Richmond offices of financial advisor David J. Wright. Here, it was enjoyed for about four years but then David moved to Vancouver offices. I felt that as it was something the public enjoyed, it should be shown in a place where the general community could enjoy it. Richmond Hospital Foundation was pleased to accept the triptych for permanent display in Richmond Hospital. It has now been installed in the waiting area for Diagnostic Imaging . 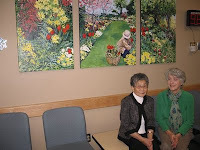 Last Thursday, I was able to go over to the hospital to see the painting on the wall and Kay Sakata was happy to see her garden up for everyone to enjoy. Pictures were taken for the hospital newsletter so people who haven't seen the garden yet, can hear about it. "Mrs. Sakata's Garden" is in Gallery Two. Photo shows its present location and Kay Sakata and me. More rain this weekend and all the more reason to think of sunnier times. One painting that I finished of Cesky Krumlov is up at Omega Gallery (27th and Dunbar) and will be part of a group show, opening December 7th. Cesky Krumlov is more medieval and Prague is more baroque but Cesky Krumlov is still like a smaller version of Prague - the river loops around it, the castle is on the hill, the old town is centered on a town square... and the rooftops are mostly red tile . 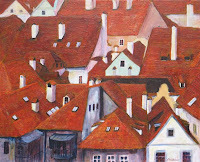 This was fun to paint -including the chimneys with their own little roofs. One of the things I like about acrylics is their layering ability - so getting the sun and shadow on the roof tops was an exercise in glazing as well as building up texture. A lot of the buildings had false fronts added - reminded me of the Old West towns with more important looking facades tacked onto an old building. Because I was looking at the rooftops from the other side, some of the decorative fronts can be seen poking up at the fronts of the buildings. I don't think I'm finished with rooftops yet! It's pouring wet today, which makes last weekend so good by contrast. Tanya had organized a plein-air instruction group with Brent Lynch so there our group was in the great outdoors. Plein air is the French term for painting outdoors and painting what you see. Brent says he just calls it "field studies". He also reminded us that we were painters first and not "reality recorders". He said "I realize there is no substitute for the real thing. There are direct experiences in the field that you cannot have in the comfort of the studio." It was cool out but most of us were enjoying pocket-warmers - and it wasn't raining! No great masterpieces yet, but I have a couple of little field studies that I think can be worked up into something a bit bigger in the warmth of the studio during winter. Some of us have been doing some plein-air and intend to keep at it - although, preferably leaving it until Spring now! For others, it was a new experience but fun. ---- and it was last weekend in the dry and not this weekend! My friend Sally came this morning to pick a painting for the live auction on November 29. This luncheon and auction is held to benefit the "Dream Auction". What is the dream? To quote -"Our dream is that no child in Richmond will suffer from poverty". On the surface, Richmond looks like a prosperous community- and, on some levels, it is. However, there is poverty - and poverty that is virtually invisible. Statistics show that 30.7% of Richmond's children under 15 live in poverty and that the annual income for a family of four living in poverty is $14,900 a year. The poverty gap in Richmond is one of the highest in Canada.The goal this year is to raise $35,000 toward directly helping the children of Richmond - through school breakfast programs, the Food Bank, Community Meals and Nova House. So - it was easy to make the decision to again support this very worthwhile charity. The donated painting is "Moored" which can be seen in my Gallery 2006. If anyone else wishes to support this -please come to the luncheon - and bid on auction items - maybe even on my painting! the date is Saturday, November 29 from 10am to 2 pm at the Executive Airport Plaza Hotel, 7311 Westminster Highway, Richmond, B.C. Adult tickets are $35 and are available through Gilmore Park Office at 604-277-5377. The bicycles from Prague have now made it onto the canvas - one that is 12 inches high and 30 inches long. Painting has barely begun and I am working on it only a bit at a time while working on another painting. I think I will call it "Circles and Squares" as the cobblestones are squares and there are reflected squares in the windows - which are squares. The shadows and overlapping bike wheels are fairly confusing but it is an interesting challenge that I'm hoping will make an interesting painting. Opening on November 4th at the Federation Gallery on Granville Island is a juried show called "Artist Choice". It is always an interesting show as it is open to any subject, and medium and any style. It's also a challenge to figure out what to enter... as in, "What do I want to represent me at this stage?" This year I entered my winter street scene from Rome. (See my latest gallery) I had a lot of fun layering on glazes to get the effect of shadows on the cobblestones and buildings. Fortunately, the judges liked it too - and it is in the show - which runs through November 16th. Our small drawing group is well-represented as Tanya Bone has had a painting accepted and Larry Tillyer has two in the show. The images will also be shown on the website for the Federation of Canadian Artists. I'm currently working on a drawing for a new painting. It is based on a line of bikes and a scooter that were in a courtyard in Prague. I thought all the wheels overlapping would make something different for a painting. Well! It probably will if I survive it. The drawing is a real challenge and painting it may very well be more so. I always think it is funny when people say "Oh, you paint - that must be so relaxing!" Actually, painting is work if you are thinking about what you want to achieve. I think this painting will definitely be one that I will work on for a bit at a time - and paint other things in between - or it just might prove to be a new form of artistic torture. Currently, there is an exhibit in Kelowna in two side-by-side galleries - Hambleton Galleries and Art Ark Gallery called Art Visions 2008. Organized by the Central Okanagan Chapter of the Federation of Canadian Artists it is a juried show that was open to all other FCA members. Apparently the competition was stiff - so I was really pleased to have "Windows" accepted. Unfortunately I couldn't make it to the opening - which must have been a very nice event. The show continues to November 6th. The September/October 2008 edition of "art avenue" (volume 8) shows a photo of my painting "Birches-Winter" from the Canvas Unbound III show of May 20-June 3 at the Federation Gallery. This is the painting that I blogged about on May 16th and it is nice to see it in the magazine. If you want a copy, you can pick one up at the Federation Gallery on Granville Island. I've recently returned home from two weeks in the Czech Republic and one week in Rome. I am planning paintings based on this change of scenery. So far, I haven't picked up a brush as I was distressed at how thin and listless Albert the cat was. I made a veterinarian's appointment and a number of tests were done and x-rays taken. Poor Albert had cancer. He was a wonderful cat, very loving and full of personality and ideas as to how he wanted things to be. He was also very handsome with fluffy black fur and long white whiskers. I painted his portrait a few years back and it was hung for a show in Richmond Art Gallery. I held him in my arms so he would know he was loved while he was put to sleep. I wanted to be supportive for him as he had been so loving over the years. Albert is much missed. Well, better late than never and all that sort of thing- finally got the photos together and now there is a new gallery added to the website. It is a total "mixed bag" of various directions I'm exploring. "Apple Grid" is 16 of the 6x6 apple paintings - sixteen different varieties. One of the apples has a bite out of it - but- not shown- there is an alternate apple (unmunched) that could be hung in the grid - or beside it! "Reading" and "Teatime"are two very recent paintings done "En plein aire"- outside painted on the spot. In this case, the "spot" was Tanya's garden. It is an interesting challenge to paint quickly enough to get it "done" before the model's time is up. The time pressure can actually prompt a lively painting. "#7 Plane " is one of the series of tool paintings. Earlier ones include "Compass" and "Chisel".They are all "mixed media" as I have involved bits of collage with construction plans and drawings in conte as well as acrylic paint. These are inspired by my Dad's old tools - with so much more character than modern offerings from the hardware store. There will probably be more tools painted in the future. "Early Snow" is also mixed media with built-up texture as well as many bits of collage. "Evening- Steveston Landing" is the latest in what seems to be an ongoing look at Steveston Landing at various times. I probably like it best when the lights come on and add to the reflections. Positioning of boats and the height of the tide make for changes in the scene. In this latest version, I was interested in the magical feeling of lights reflecting in the water. For something entirely different, take a look at "Gelato". This was pure fun - can you tell that I like ice cream? Last night's opening for "Oil and Water" saw a good turnout for a varied show - varied in subject, media, sizes and styles. I was pleased to see a red dot (sold) on my painting of the Eva but I don't know who bought it. Once, at a talk, I was asked if I regretted selling a painting - "letting it go", so to speak. I answered - and still feel- that for me it is completing the creative circle. I get enjoyment from the idea, working it out and creating the painting. Then, when it is completed, to have someone else enjoy it adds to my enjoyment. I can see, if you are an amateur, that you might want to keep what you see as your "best" work if you afraid you won't be able to make one as good again. But, for me, it is the process that is important and I love to think of other people enjoying the "product". When I know the name of the person who has bought a painting, I like to send a thank-you note and tell the owner a little bit about how the painting came to be. In California, it is the law that artists are to be told who the buyer is. Here, it varies, with privacy laws sometimes used as the explanation of why the artist is not told who has their painting. Some of the nicest things I have been told about my paintings are from their owners who have said things like "I enjoy it every time I go through the entry hall." to "Every time I look at it, I see something else." That's the best payment of all! The juried show "Oil & Water" will open this Thursday, July 24 in the Kiwanis Longhouse Centre for the Arts in Tsawwassen. The reception starts at 6:30 pm and closes at 9:00 pm and the award presentations run from 7:30 pm. There will be refreshments- guaranteed good as Margreth is in charge. I have two pieces in this show. One is of the "Eva" - the fishboat that is in Finn Slough. It is captured half in warm sunlight and half in shadow. 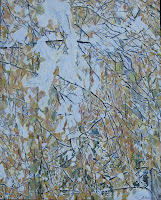 "Early Snow" is the other painting- inspired by a snowfall that came before all the leaves were off the birch. It was an interesting mix of golden leaves, dark twigs and clumps of snow. As I worked on it, I decided that such a complex of shapes needed a more complex approach, so I built up texture and worked in bits of collage to create an interesting and complex surface. There are many colour variations. At times, it almost felt like a jig-saw puzzle! Take a close look at the surface and see what you think. I will be at the reception and also "sitting" the show one day - time to be announced when I know. I hope to see you there! The display committee has done a great job hanging my work at White Rock Community Arts Council Gallery. 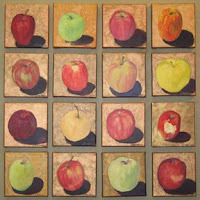 I especially enjoyed seeing 16 of my 6x6 apple paintings hung as a grid. I had them arranged on the floor at home, working out the arrangement - but it was a real pleasure to see them hung. One apple has a bite out of it - but there is an alternate square with the apple whole- so the purchaser can choose how to hang it. I used a metallic gold background for these paintings as each apple then becomes a sort of icon. Just for fun, the produce tag showing the type of apple, is stuck on the back of most of the paintings. Because of the long weekend, it now seems that the show will close on June 28th, instead of the 30th--- but still time to get out there to have a look! Thursday night, my show at White Rock Community Arts Council opens, The gallery is at Windsor Square mall - 90- 1959 152 Street, South Surrey. Regular hours are Monday to Friday from 10 am to 4:30pm and Saturday from 11am to 3pm. The reception is June 5 from 7pm to 9pm. Although the invitations read that the show continues to June 30th, it will actually be taken down on the 28th, because of the long weekend with Canada Day being on the Tuesday. I have a variety of pieces in this show - from a grid of 16 apples to a couple of street scenes from Rome. The apple grid is being hung with one apple with a bite out of it - but I painted an alternate square in case someone wants all whole apples! This is a nice space and sales from here go to support Community Arts Council activities. Because of grants, I am asked to say something "educational" when introduced - so I think I'll do a little explaining about the nature of acrylics and what they are. Canvas Unbound III opens on May 20th and runs to June 3 at the Federation Gallery on Granville Island. As with all FCA shows, it is a juried one. 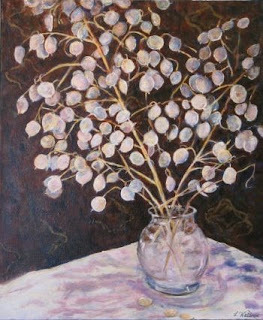 I have a canvas in this show- " Birches-Winter". It is actually just *one* birch but you don't see the trunk in the painting- you see the five sections- which is what you see looking out the window while seated at the computer. 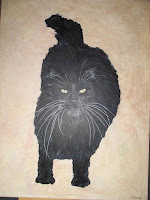 This painting should probably be subtitled "Albert's Choice" because Albert the cat was sitting on my lap. I had finished what I was doing on the computer but Albert was in no mood to move. When I looked to see what he was looking at, I noticed how nice the light was catching on the birch trunks and grabbed my sketch book to check out how it might look. There were Redwing Blackbirds visiting from the marsh so I felt they needed to be in the drawing too. After colouring up the sketch, I decided to work it out as a painting. It took quite a long time as there were so many branches to deal with, but I was quite pleased with the end result. Margreth commented that it was "very fresh". Albert has made no comment. Doors Open is over for another year now- but I still haven't tidied everything away. One hundred and twenty-one people came through my studio. Many were doing a complete "studio tour" as their choice of visits. There was a lot of interest and everyone seemed to really be enjoying themselves. A lot of people expressed pleasure at finding how many artists are here, working away, right in Richmond. Making art is a "must" activity for an artist. It can be lonely so it is a pleasure, too, for an artist to have people come and look and enjoy looking. As part of this, several artists are holding Open Studios. This is a chance to browse, meet the artist, ask questions - and have what we hope is an enjoyable outing. Along with my neighbour-artist, Alice Saunders, at 8171 Fairdell Crescent, I am holding a free draw for an original painting - so there is your chance for *two* free paintings - as well as the regular Doors Open draw for Gateway Theatre tickets, local wines and other goodies. My address is 8751 Fairdell Place - just down the cul-de-sac from Alice, and I'm looking forward to Doors Open! 7277 River Road, Richmond "
There will be some art auctioned and some artists (including me!) will be there with art for sale with 50% going to RHF. I'm planning on bringing quite a few of my little fruits and veggies that are popular for dining areas and kitchens. Some people like to buy them in pairs or sets. Quite a few are just 6"x 6" and are $95. All are originals, one of a kind. 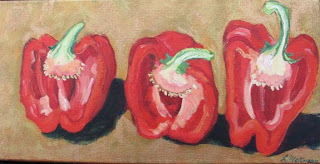 Just for fun, several have the produce stickers on the back of the canvas.